The Pulitzer Prize–winning author of All Over but the Shoutin’ continues his personal history of the Deep South with an evocation of his mother’s childhood in the Appalachian foothills during the Great Depression, and the magnificent story of the man who raised her. Charlie Bundrum was a roofer, a carpenter, a whiskey-maker, a fisherman who knew every inch of the Coosa River, made boats out of car hoods and knew how to pack a wound with brown sugar to stop the blood. He could not read, but he asked his wife, Ava, to read him the paper every day so he would not be ignorant. He was a man who took giant steps in rundown boots, a true hero whom history would otherwise have overlooked. In the decade of the Great Depression, Charlie moved his family twenty-one times, keeping seven children one step ahead of the poverty and starvation that threatened them from every side. He worked at the steel mill when the steel was rolling, or for a side of bacon or a bushel of peaches when it wasn’t. He paid the doctor who delivered his fourth daughter, Margaret—Bragg’s mother—with a jar of whiskey. He understood the finer points of the law as it applied to poor people and drinking men; he was a banjo player and a buck dancer who worked off fines when life got a little sideways, and he sang when he was drunk, where other men fought or cussed. He had a talent for living. In Ava's Man Rick Bragg has written a unique tribute to his maternal grandfather, Charlie Bundrum, a man he never knew but one he learned about through the stories of others. Bragg introduces us to Charlie through the carefully written anecdotes he has collected from those who knew Charlie personally. Charlie was a husband, father, roofer, and bootlegger. He was a man who lived by his own personal code in a specific area and place in time. Charlie Bundrum was "so beloved, so missed, that the mere mention of his death would make them [his grown daughters] cry forty-two years after he was preached into the sky."(pg. 9) "He grew up in hateful poverty, fought it all his life and died with nothing but a family that worshiped him and a name that gleams like new money." (pg. 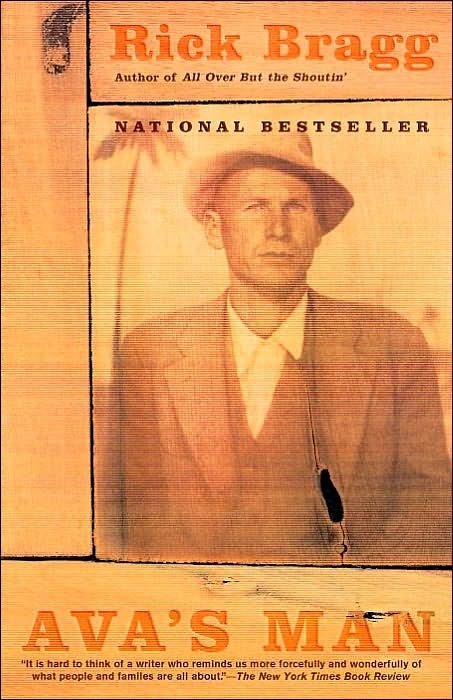 12) Bragg said that he wrote this book in response to those who told him that he "short-shrifted them in the first book, especially about Charlie, about Ava, about their children" (pg.13) After Bragg's All Over but the Shoutin' readers wanted to know more about the people who were his mother's parents. This biography of Charlie Bundrum is a truly amazing tribute. Bragg's use of language clearly evokes the time and place as well as establishing the characters. This is a memoir that could have become maudlin, but I really think that the quality of Bragg's writing sustains the narrative and elevates it above the ordinary. This is a genuine, honest, portrait of the grandfather Bragg never knew except through the stories of others and a book that should be treasured for generations to come.